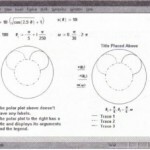 Mathcad provides several ways to help you to identify what it is that you’ve plotted. • A title, either above or below the graph. • Axis labels to describe what’s plotted on each axis. • Legends to identify the individual traces. 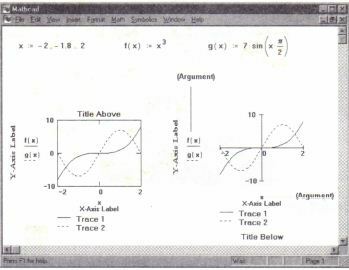 • Arguments showing what you typed into the x- and y-axis place holders. 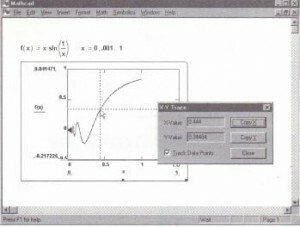 • Choose Graph~X- Y Plot from the Format menu or double-click on the selected graph. 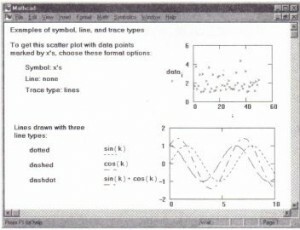 Mathcad displays the dialog box for formatting X-Y graphs. If necessary, click on the Labels tab. 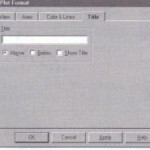 • Type a title for your graph into the Title text box. • Click on either the Above or Below button, depending upon where you want to put the title. Note, however, that Mathcad doesn’t display the title until you click “Apply” or close the dialog box. • Click “OK” to accept your changes. 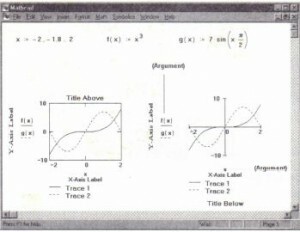 Mathcad redraws the graph with the title in place. Alternatively, click “Apply” to preview your title without closing the dialog box. • Click in the graph to select it. • Choose GrapheeX> Y Plot from the Format menu or double-click on the selected graph. 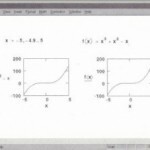 Mathcad displays the dialog box for formatting X-Y graphs. If necessary, click on the Labels tab to see that page, as shown in the preceding section. • Type the axis labels into the appropriate text boxes. • To save the label name without having it appear on the graph, click X-Axis or YAxis to remove the check. • Edit the information for the title as appropriate. • To remove a label, delete it from the text box. • Click “OK” to close the dialog box. • Arguments are the expressions that you typed into the placeholders of the x- and yaxes to create the graph. By default, Mathcad displays arguments. • Legends are labels that appear underneath the graph containing a name and an example of the line and symbols used to draw the trace. By default, legends are hidden. • Click on the graph to select it. • Choose Graph::::}X-Y Plot from the Format menu or double-click on the graph. Mathcad displays the dialog box for formatting X-Y graphs, as shown below. If necessary, click on the Traces tab. • To suppress the display of the arguments, click on Hide Arguments to add a check. • To show the legend, click on Hide Legend to remove the check. 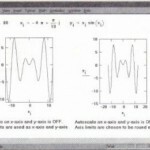 • You can resize the graph, making it proportionally larger or smaller or stretching the x-axis or y-axis for emphasis. • You can zoom in on a portion of the graph. • You can get the coordinates for any point that was plotted to construct the graph. • You can get the coordinates for any location within the graph. The rest of this section shows how to use these features. •Move the mouse pointer to one of the three handles along the edge of the graph. The pointer will change to a double-headed arrow. 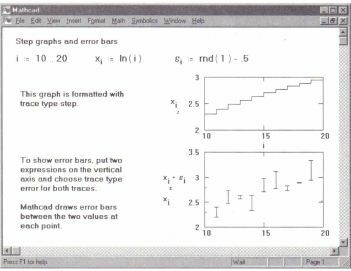 • Press and hold down the mouse button and move the mouse in the direction that you want the graph’s dimension to change. • Once the graph is the right size, let go of the mouse button. • Click outside the graph to deselect it. 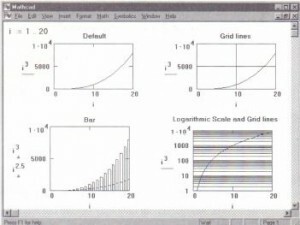 Note that when you change the size of a graph for which the Auto Grid is set, Mathcad may add or delete tick marks or grid lines or change axis limits to maintain the default spacing. • If necessary, reposition the X-Y Zoom dialog box so that you can see the entire region of the graph you want to zoom. • In the graph region, click the mouse at one corner of the region you want to magnify. • Press and hold down the mouse button and drag the mouse. A dashed selection rectangle emerges from the anchor point. • When the selection rectangle just encloses the region you want to magnify, let go of the mouse button. If necessary, you can click on the selection rectangle, hold the mouse button down, and move the rectangle to another part of the graph. • If necessary, reposition the X-Y Trace dialog box so that you can see the entire region of the graph. Note that the Track Data Points check box is checked. 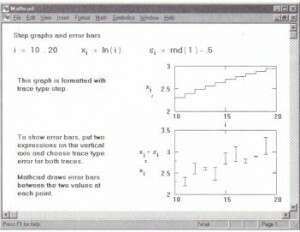 • In the graph region, click and drag the mouse along the trace whose coordinates you want to see. A dotted cross hair jumps from one point to the next as you move the pointer along the trace. • If you release the mouse button, you can now use the left and right arrows to move to the previous and next data points. Use the up and down arrows to move to other traces. • As the pointer reaches each point on the trace, Mathcad displays the x and y values of that point in the X-Value and Y-Value boxes. 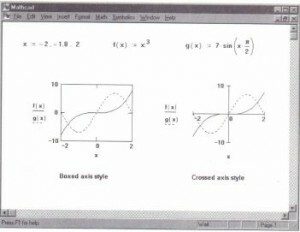 • The x and y values of the last point selected are shown in the X-Value and Y-Value boxes. The crosshair remains until you click outside the graph. • Click “Copy X” or “Copy Y”. You can then paste that value into a math region or a text region on your Mathcad worksheet, into a spreadsheet, or into any other application that allows pasting from the clipboard. • Double-click on the control box in the upper-left-hand corner to close the X-Y Trace dialog box. The crosshair will remain on your graph until you click anywhere outside the graph or click the “Close” button. • Follow the above procedures to call up the X-Y Trace dialog box. • Click on Track Data Points to uncheck it. • When you release the mouse button, the X-Value and Y-Value boxes show the x and y values of the last pixel selected. 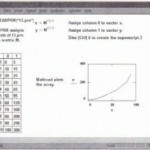 Reading coordinates from a graph. Choosingfrom the scrolling lists under Line and Symbol.